While attending an event recently I was most fortunate to be able to connect with Kevin Hall for a short time after he spoke to a couple hundred people. 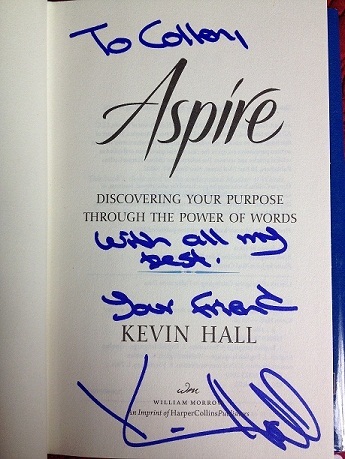 Kevin presented his beautiful book Aspire to me as a gift. I own a lot of books as I have been a collector of specific books since I was thirteen years old, Kevin's book is my most treasured... it's absolutely a must read! Kevin does his amazing Firegroup coaching calls a couple times a months... I'm very excited in fact I am absolutely thrilled to be able to post these call for all of you on the V-team Audio Library as we can make them available. I know you will find the journey with Kevin Hall and his guests amazing! I would love to hear your comments about this first posted audio with Kevin guest Stedman Graham. Do you want to be Unconquerable and Unstoppable? Despite being born with only one leg Anthony Robles was voted the NCAA's Most Outstanding Wrestler in 2011 after his undefeated season. Listen to Kevin Hall with Anthony Robles... Amazing! An amazing audio... take a moment to listen to this as soon as you are able. A beautiful gift, really exceptional!